I have been lying in bed all weekend, trying to get over a bout of the flu. 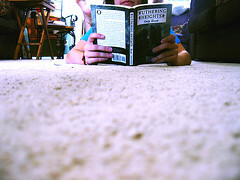 I decided to preview a video I asked our media specialist to buy for our library: Great Books: Wuthering Heights. If you are unfamiliar with the Great Books series, they are actually fairly good documentaries about books produced by Discovery Schools. Back in the day when TLC used to be an acronym for “The Learning Channel,” and as such, actually produced educational content, the Great Books series could sometimes be caught on broadcast on that channel. I disagree with a few conclusions drawn in the Great Books episode on Wuthering Heights. Emily Brontë is known to have been an intensely private person. She was furious when her sister Charlotte read poetry Emily had written. When Anne and Charlotte went to London to reveal their identities to their publishers, Emily refused to go and insisted upon remaining anonymous. She was again angry with Charlotte when Charlotte revealed that “Ellis Bell” was her sister. However, the DVD conflates this desire for privacy or perhaps even shyness (although I admit I don’t know enough about Emily to determine if she was shy) with “madness.” At one point, the video points out, rather boldly and without explanation or foundation, that because Emily enjoyed writing about her fantasy world of Gondal, she was “in danger of losing her mind.” Later, the video concludes that she based her character Heathcliff on herself, again without presenting evidence or explanation. My first thought was that if I were a student watching this video, which seemed authoritative and informative, I might take these statements at face value rather than question them. After all, they are produced by Discovery School, so one can infer they are accurate, reliable, and educationally sound. I suppose if I’m going anywhere with this thinking-aloud exercise, it is here: it’s critical for teachers to evaluate materials they are thinking of presenting to their students, but more importantly, it’s critical to do your own research as well. If I had seen this video ten years ago as a relatively new teacher, I might not have questioned some of the conclusions drawn by the video’s producers because I myself didn’t have the slightest knowledge about Emily Brontë’s life, and while I’m far from an expert now, I have at least learned enough both in content and as a critical thinker to discern the accuracy of materials I’m previewing. Instead, I came away from the video feeling that the producers had not given Emily Brontë much credit for possessing an imagination that allowed her to write fantasy stories without necessarily living in a fantasy world or to create a character purely out of a talented gift as a writer. Of course, not wanting to give Emily Brontë much credit for her imagination is not new, but one would hope educational materials produced in 2005 would be more enlightened in their view. If I were to use this video with my students, I would challenge them to locate evidence regarding the conclusions drawn in the video. It might be a good critical thinking exercise for them. However, my instinct says not to show it. With no abundance of time and no shortage of materials, it is not the best course of action, in my mind, to use class time for materials I find misleading at best, erroneous at worst.